As those of you who have read this blog for any amount of time know, I’m a big fan of Jason Miller’s Strategic Sorcery materials. One of the nice things is that once you’ve signed up for the course, you will get invitations to participate in world-wide rituals, usually focused on some sort of planetary energy. A few days ago, I received a PDF with instructions for a global Mercury rite to be performed between July 29th and August 1st. So after getting Hufflespawn to bed, I read through the ritual and decided to stretch the ol’ magical muscles. I waited until 9:44 PM, the beginning of the hour of Mercury, on the Day of Mercury, to start the rite. 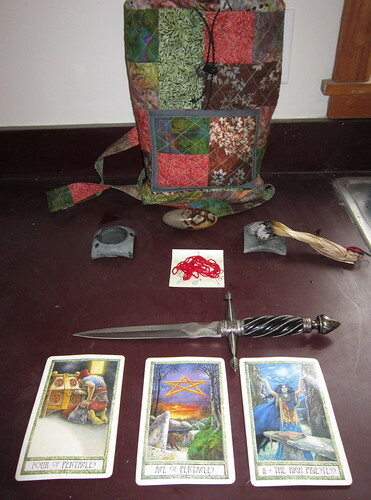 The Moon was in Capricorn, and waxing/almost full, which should lend a more mature and stabilizing influence to all that Mercury energy flying around. For offerings I used cinnamon incense, dried Nicotiana sylvestris from last year’s garden, and apple cider. 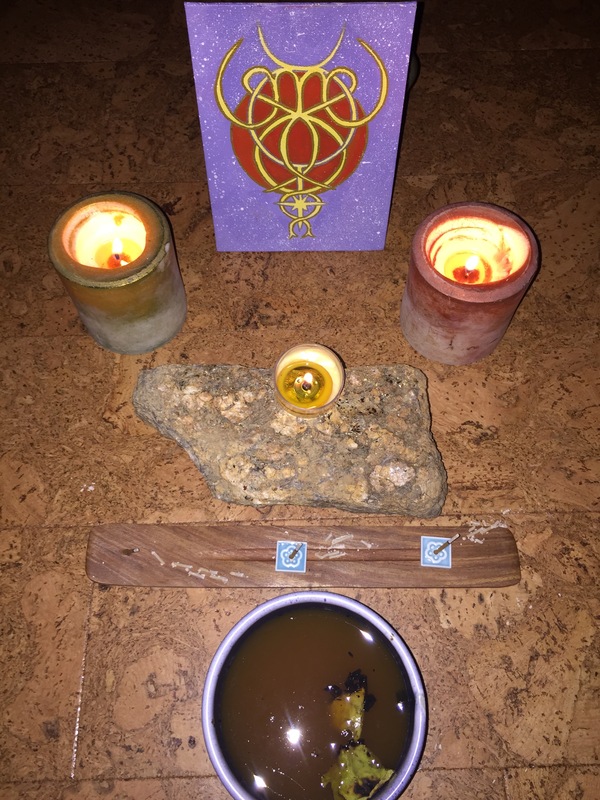 I set up the circle with eight beeswax candles and my own personal Mercury sigil, in addition the to usual ritual paraphernalia. Even the most eloquent orators have practiced their art. I botched reading one section of the rite pretty badly. I took a deep breath and delivered it again, and woah, there a punch there that I lacked before! The story about William Jennings Bryan practicing speaking in the woods comes to mind. Sometimes clouded vision produces rainbow or other sights of beauty–but to see clearly you still have to wipe them away and stare into the hard edges of the fire. Steady breeze from the West during the entire ritual. The following phrase floated out of the ether into my brain as I closed down the grove: “Three again, and three times three, As I will so must it be.” Now curious about repetition of 12 in magical practice. Must go research! Very much inspired to make a set of 100 beads for longer ritual chants. Most of my rosaries tend to be in sets of 3, 4, 7, or 9. I’ve consciously avoided multiples of ten since that’s what the Catholics do, but they tend to use repeats of five decands, so I think I’m good. I can still pronounce Latin really easily aloud. Thank you, Dad. Definitely another ritual for the every-growing grimoire. I’m looking forward to whatever Mr. Miller chooses to tackle next. Week 41 of the PBP. Week 20 of the PBP. 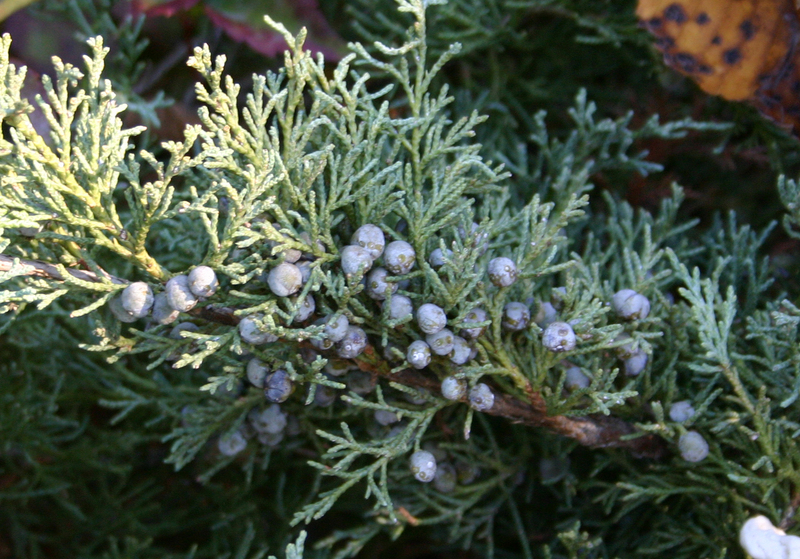 Juniper has been something of a love-hate relationship for me. I love the berries, love the flavor that they give to corned beef and other stews, love the smell of its burning branches. My personal association are of Mercury and Air, particularly because of its fragrant, opening qualities. This is another shrub I would like to make a wand of at some point, though finding a specimen large enough to do that can be tricky. An ogham few for my North American set is much more likely at this point! It is also sometimes called ‘Bee Balm,’ as bees are fond of its blossoms, which secrete much nectar. […] It is a very ornamental plant and readily propagated by its creeping roots and by slips or cuttings, which, if planted in a shady corner in May, will take root in the same manner as the other Mints. —Grieve 1931. Week 27 of the PBP. 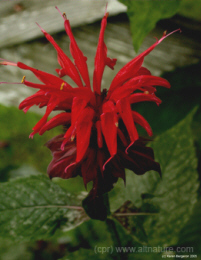 Bee balm, often called bergamot, is really funny looking stuff. With flowers that range from blood red to Barbie pink, they look like punk teenagers clustering together with spiky Kool-Aide hair. My fascination with bee balm (pronounced “bee bomb” in my native NJ :p) started when I first thought it was that oh-so-wonderful citrus flavor that is the hallmark of Earl Grey tea. It’s actually not, Earl and Lady Grey being flavored by the bergamot orange, but it was enough to pique my interest at the time. I worked at a garden center when I first encountered this guy and was truthfully a little shocked when I saw the plant that produces such a wonderful aroma. I suppose it makes sense that the flower would be just as showy as the flavor! Wrong kind of bergamot, but the pic was too good to pass up! Magically speaking, bee balm is written about only by Cunningham, who sees it as Feminine, Airy and unattached to any particular planet; it brings “clarity and good working order” to any situation (2003, 54). Personally, I associate Bee Balm with Fire and Mars, both from its growing habit and flavor. I do agree about it’s ability to bring clarity, or more specifically, burn away confusion. While I have not yet brewed tea from its leaves, it’s something I would like to try this summer since my neighbors have a bumper crop this year!